Peter Comestor (i.e. Peter 'the Eater', a nickname given to him because of his voracious appetite for knowledge) wrote the 'Scholastic History' in Paris in about 1170. It is a continuous history, from Creation until the end of the Acts of the Apostles, based mainly on the narrative books of the Bible. This copy was owned by the library of Rochester Cathedral in the Middle Ages. 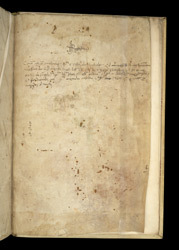 On this back flyleaf is a pledge note, which records that Thomas Wybarn, a monk of Rochester, deposited the manuscript in the Chichele chest at Oxford University, in exchange for a loan of 26 shillings and 8 pence, on 20 August 1468.